As reported on BikePortland, Portland, Oregon has ended its search for a bike-sharing vendor and has chosen option D - none of the above. 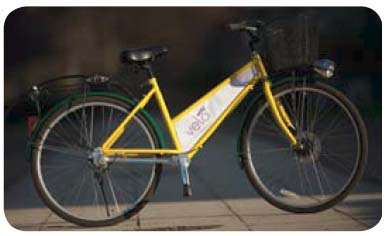 Portland originally began its search for a vendor to provide bike-sharing services in February 2007 and had three serious bids from Clear Channel Outdoor, The Portland Bike Company, and Library Bikes. Reasons as to why none of the potential vendors were selected to operate this service has not been disclosed at this time. Potential reasons as to why there was no selection could include: 1) an economical bike-sharing technology was not offered without an outdoor advertising contract, 2) the user cost to the public was too high, 3) sufficient insurance or indemnity to the city was not offered, and 4) a required experience level was not available. Hopefully Portland will not give up on bike-sharing. As the nascent field of bike-sharing grows in North America, more vendors and experience will make themselves available in the future to help Portland finish what it embarked upon. Portland is certainly one of the best cities in the U.S. for bike-sharing with the highest bike mode share of medium-sized American cities. "Far from giving up on the idea, [Portland] Commissioner Sam Adams’ office says just they’re taking a new approach. "Oppenheim says the legal restraints of the RFP process tied the hands of the committee formed to choose a vendor. 'Under the contraints of the RFP,' she said, 'we can’t talk to potential providers and continue to learn from them… it was hindering our ability to do the analysis we wanted to do to make sure the program was the right style and scope that would work for Portland.' "
"Stationnement de Montréal created the innovative Public Bike System (PBS), which it will also manage. The system includes bikes, technical platforms, bike docks, pay stations and proprietary software that runs it all. "The design of the physical components of the system was entrusted to world-renowned industrial designer Michel Dallaire. The bikes feature clean lines and a sleek look that is carried over to other system components. The bikes are also notable for their sturdiness and safety.
" 'This is a unique concept that will allow any interested city to acquire a public bike system that can be rapidly set up on their territory with no technological development or infrastructure costs,' said Alain Ayotte, executive vice president of Stationnement de Montréal. "Innovation is another hallmark of the PBS. It employs cutting-edge technologies to their best advantage: the entire system is solar-powered and uses wireless communication. All the components are modular and require no permanent installation. With no need for external energy sources, stations can be installed in virtually any location without incurring expensive infrastructure work. Stations can be set up in a matter of minutes, leaving no trace of their presence once they are removed. User-friendly, the system requires only an access card or credit card with no intermediaries.
" 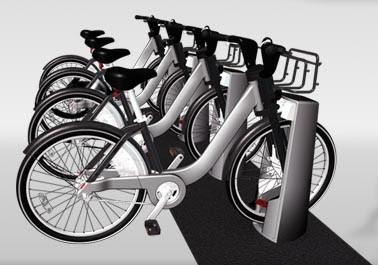 'By developing the Public Bike System from a clean sheet, Stationnement de Montréal is in a position to deliver a high-quality, turnkey product that has been pre-tested to optimize efficiency, suitable for cities big and small,' added Mr. Ayotte." If you have any ideas for naming their program, you can do so at www.findmyname.ca. The grand prize is a lifetime subscription to the program. According to Rome Mayor Gianni Alemanno (and translated by Google), "This initiative is an incentive to create opportunities and not a punitive system, with alternatives closer to citizens who can change the habits of the population. Cycling is a beautiful experience, even fun, which creates a more direct contact with urban reality." Article from Fondazioni Italiani in Italian and English. An article in this week's TIME magazine titled "Bike-Sharing Gets Smart" discusses the imminent launch of D.C.'s bike-sharing program. I'm quoted having said, "It's not a good idea to share helmets because you have sanitary issues and sweat issues" and that folks should "B.Y.O.H." or bring your own helmet. While I personally wear a helmet when riding my own bike, helmet use is not mandated on any bike-sharing program of which I'm aware, nor should it be. Bike-sharing has been so successful because it has allowed for the impromptu bike trip as well as not needing to carry a helmet if the rider chooses not to. If impromptu trips were removed from overall bike-sharing trips, I haven't seen any survey data on this yet, but I'd guess that this would negatively impact the overall number of bike-sharing trips. Mandating helmet use on bike-sharing, or bike transit, is the equivalent of mandating one bring a seat belt in order to board a bus. It's a good idea to wear a seat belt in a motor vehicle to limit injury in the case of a crash, but by not having one, it shouldn't prevent folks from riding the bus. 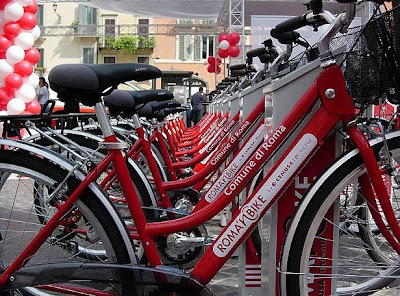 Mandating helmet use with bike-sharing would be similar and certainly suppress the popular use of the bike fleets. Bike-sharing programs providing helmets attached to the bikes or at kiosks could be a sticky issue, literally. After only a few trips on the head of a sweating individual on a steamy day of 100 degree Farhenheit (38 Celcius) heat, helmets would become dripping. Not to mention helmets being left outside in the elements to grow mold. Even with hairnets to make it sanitary as some jurisdictions which require helmet use by adults have discussed, nets would not generally be used as no one wants to wear a hairnet in public. There's also the liability concern about providing to the public a helmet that has lost its protective ability by having been dropped or involved in a previous crash. A helmet like this would cease to be useful in case it were needed, thereby allowing damage to the wearer and causing certain lawsuits. 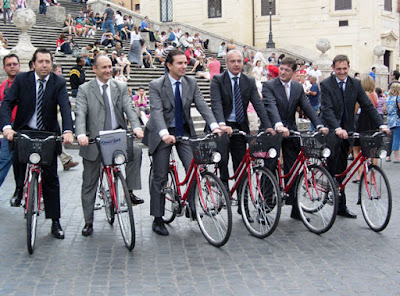 No 3rd generation (high tech) bike-sharing programs that I'm aware of require the wearing of a helmet. Now that bike-sharing is set to take over the U.S., many American cities with helmet laws for adults will need to grapple with the feasibility of these laws and how they apply to bike-sharing. What should be done is to create safer and more bicycle facilities, such as bike lanes, cycle tracks, and trails as safety of bicyclists is proven in numbers. In addition, safer bicyclists and motorists are minted with improved education of both groups. 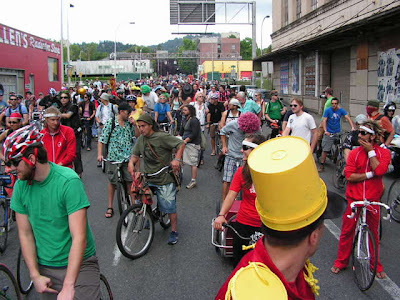 Safe bicyclists are created through bike education classes for all ages, such as the Washington Area Bicyclist Association's Safe Routes to School program, bicycle rodeos, and Confident City Cycling classes - to provide some regional models. Safe Routes to School educates children on how to safely walk or bike to school. Bicycle rodeos teach children how to ride a bike and practice their skills with a series of obstacle courses. Confident City Cycling classes teach adults who either never learned how to ride or need a refresher on proper riding techniques. As bicycle safety education is lacking from most schools' educational offerings, these classes are absolutely necessary. Motorists also need to be better educated about watching for all street users as this Transport for London video deftly points out, driver's manuals and tests in the U.S. should have bicycle components, and motorists need greater enforcement and higher penalties should they put the lives of other street users (especially those who are most vulnerable) at risk. Race to Be First University Program in U.S.
With the race to be the first American city with a 3rd generation bike-sharing program pretty much settled on Washington, D.C., the race to be the first American university is still open to takers. Readers of The Bike-sharing Blog will know that The University of Washington in Seattle is planning to launch a program this fall, however, Saint Xavier University in Chicago is hoping to beat them to it. "Chicago (May 9, 2008) Saint Xavier University students, faculty and staff will have the option of a self-service bike sharing program beginning next semester. "Over the summer, the University will install the SXU Green Bike Program, providing 65 European pedal bikes that can be automatically checked out 24 hours a day, seven days a week with a Cougar card and returned to any of several computerized docking stations around campus. The first 15 minutes between docking stations will be free, and patrons can use cell phone technology to more easily arrange for a bike. "Many universities across the country offer some form of sharing program, but Saint Xavier will be the first to use the shaft-driven bikes from the French company Veloway, Europe’s premier bike share distributor. More information will follow this summer.
" 'The SXU Green Bike Program will be a remarkable addition to this campus,' said Assistant Vice President for Physical Facilities Paul Matthews. 'This latest in a long line of green activities at Saint Xavier will allow students, faculty and staff to forego their fuel-burning vehicles and travel campus in a clean and sustainable way.' "
Bike-sharing at universities makes as much sense as breathing fresh air. The transportation budgets of universities for the most part focuses too greatly on the provision of parking spaces. At around $20,000 to build a parking space according to a study by George Mason University, it seems that not constructing as few as 15 parking spaces and reallocating these funds to a bike-sharing program would better serve a university community by improving mobility.